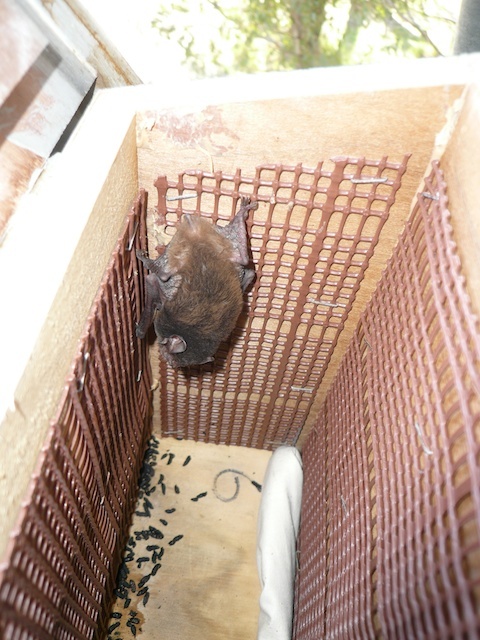 So you’re keen to build your own bat box…. It’s not that difficult but you will need some woodworking skills such as using a power saw. The idea is to go to your local Bunnings store and purchase some 16mm plywood. The length of the rear panel is 525mm. The front panel is 255mm. Width is 195mm. I have a roof slope of 15deg to channel the water away. The side walls are 100mm wide. The entrance gap at the 45 degree sloping bottom must be between 15mm to 20mm. This is absolutely critical. The roof is hinged to allow inspection of the box. You don’t have to do this if you don’t want. Sometimes it may be advisible to apply talcum powder to dissuade the ants sometimes. On the inside walls you have to staple some galvanised steel mesh. This is for the bats to hang onto. It’s available from Bunnings again sold as fireproof gutter mesh 190mm x 10m. Don’t use plastic gutter mesh as it warps and twists in the heat. The beauty about the bat box is it doesn’t attract rats, feral bees or other large animals that don’t belong there. Sometimes you might see a Huntsman spider co-habituating with the bats. But that’s okay. He’s there to help keep the box clean. Just don’t fall off the ladder with shock when you see them…. Paint the box with a couple of coats of good quality exterior paint. I use gun-metal grey because it blends in with the trees and buildings. Site orientation is critical. Facing the wrong way will reduce you chances of success. Face them between NW to East in Western Australia. It will bring joy to your heart knowing that you provided a home for our unseen heros of the night. While we sleep they work……. Guess who we have here??? My son Andrew Gunnell Phd. is an authourity on bats and he advised me that when I am making nesting boxes for them I should hang a strip of shade cloth from the roof to give the bats something to hang onto. Sounds like a good idea, go for it. I myself staple metal gutter mesh on the inside of my bat boxes. Build a plywood box measuring 220mm x 220mm and 600mm deep. Install a wire mesh ladder in the inside then cut a 80mm hole in the front and you’ll be in business. Thanks for your information. I am keen to build some boxes for bats that have turned up in my house. I am a little unclear from your instructions about the length of the box and the location and size of the opening. Is the bottom floor also sloped to allow faeces to roll out? I’ve included some front and rear dimensions in the “DIY bat box” posting. The bottom 45 degree sloping floor is for the guano (bat droppings) to roll out. The bats like a clean box. Just built a bat bot and put it up on a 4m pole. My question is how much movement do they tolerate? The box and pole is swaying in strong wind, which there has been lots of in the 24 hours since erecting the box, but not much more than if it was tied to any of the trees here at around the same height. I’m thinking of stiffening the bat pole. No pun intended, much. The bats will tolerate the swaying. They think its a tree anyway. If you decide to stiffen it up don’t attach any “stay”wires like a TV antenna. The bats will hit them and be put off. I would re-enforce the pole itself if you are really worried. The bat box’s aspect is not perfect now though, ESE. It’s open all around it if that helps. Not sure, hard to change as it is set by the fork in the tree.